Can you really buy Miami and Miami Beach properties for only $37.50? Well, sort of. 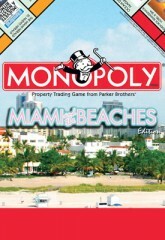 =) Yes, you too can own your very own piece of prime Miami Beach real estate. But it will be Monopoly style! The all-American favorite board game has a Miami and the Beaches version. And your purchase helps to benefit the New World Symphony. Check it out! Well, this one’s easy. You can’t! You can’t find a condo in the Redland because there aren’t any. So what types of properties can you find in the Redland? This one’s easy too. If you’re referring to residential properties, single family homes and a couple of manufactured home parks is all you will find in the Redland. There are no condominiums here. No townhomes. No duplexes. No apartment buildings. No multi-family units whatsoever. I think the closest you’ll get to a multi-family unit is the occasional guest cottage or in-law quarters (permits pulled and not). The Redland is at the southwest end of unincorporated Miami-Dade (still “Miami” on the letters the post office delivers to us). It is an agricultural community primarily and because of that, not densely populated. There’s lots of room to stretch your wings here. Because of this, the need for anything other than single family residences is non-existent. There is a hotel(motel?) on Krome avenue in the low 200’s. I think it has about 15 rooms. It’s the only one I know of. I stayed there a couple of nights a few years ago after one of the hurricanes took out our power. Apart from residential properties, the most common thing you’ll find in the Redland are nurseries as well as acres and acres of crops. Then, of course, there’s the businesses found mainly on Krome Avenue. Gas stations, U-picks here and there, small local businesses clustered in small strip malls and more and more nurseries. But no condos! When I moved to South Florida over 6 years ago I saw the signs all over the Redland. OK, I could see there were two different points of view going on but something wasn’t right. Even before knowing the issues or how long the battle had been going on, something was amiss. One group wanted to keep it rural. I got that one. And the other (whom I thought was synonymous with “rural”) were against them. That one I didn’t couldn’t get. What the?? I could not wrap my head around the notion that a group was trying to keep things rural and farmers were going against them to not keep it rural. Aren’t farmers rural? Don’t they have tractors and other slow moving vehicles which work best in rural areas? Don’t they have open land where their crops are planted and isn’t that where the term rural originated? Why would farmers not want to keep things rural? After a little investigation, naive me got it. The problem was that I was applying logic to this. There was no logic involved in this at all. Logic tells you that farmers embrace rural. The problem stems from the fact that greed is what’s driving this. Yeah, the almighty dollar, peso, dubloon, whatever. The farmers have been farming the land for decades. And when they’re done farming they want to be able to sell it. OK. I see no problem with this. The land is theirs. They have every legal right to sell it. Land in the Redland is listed for about $250,000 per acre. It’s a hard sell in this market, but that’s about the average list price. The Redland sits outside the UDB and if you want to build out here, you either need a minimum of 5 acres or a smaller parcel that has been grandfathered in. Developers don’t like this. I can sum it up in one word: density. Why build one house when you can stick 40 in the same space? If the Redland incorporates, developers know they’ll have a snowball’s chance in H-E-Double Hockeysticks of getting a development approved. Developers can’t build, developers won’t buy. The farmers’ exact parcel is worth less if a developer won’t buy it. The fight to incorporate the Redland, and keep it rural, has been going on for about 10 years. Here’s an article that does an excellent job if providing the history and players. I’ll be writing more about this. But for now, this should prove a satisfying appetizer. I see them all the time. Riding their bikes they look like any other boys across America two-wheeling around town. Except they’re not riding for fun. Some are barely past the boy stage. Others left it a long time ago. I’m referring to the farm workers I see all around the Redland riding their bikes to and from work. The other night as I drove west on 200th street I passed two of them, one after the other. It was pitch black and they seemed to come out of nowhere. Of course, they had been there but I just didn’t see them until they came into the realm of my headlights. I was struck by the notion that anyone who might have had too much to drink could have killed one of them. Or both. The thought still pops into my head when I see another on this mode of transportation. As dangerous as it may be to ride a bike at night on the dark, agricultural streets of the Redland, they’re thankful to have a way to get to work. Some aren’t so lucky and have to walk. I saw two ladies and a child walking in the rain one evening and backtracked to pick them up. Part of me wanted to help them and another part was troubled that they had taken a ride from a stranger. We hear so many bad things. I had my mother and daughter in the car with me and even so, they thought twice before getting in the car with us. I rejoiced at that secretly. They had been waiting for their ride when it started raining. The ride was late and they headed to Krome on foot. It was at least a mile and a half away. Just today Dad brought a migrant worker to the house to pick out a bicycle for himself. He had given him a ride in the past and knows that this man walks about 3 miles each way, each day. We have some unwanted bikes and knew it would make a difference to him to be able to cycle to work and not have to walk. I fixed him a sandwich while they looked at the bikes. It turns out he had a bike in the past but it had been taken from him. Stolen would be my guess, although he didn’t call it that. As I looked at the grown man pedal away on a bike that had belonged to my then-twelve-year-old nephew I hurt for him and those like him. Working for pay that I’m sure is less than most Americans will work for. And back-breaking work at that. Some like to whoop it up on the weekends and head down to Homestead for a little beer and a little dancing. After working hard all week, I can’t say I really blame them. Some have no way to get there and have their beers closer to home. Others don’t drink and just keep to themselves. I’d love to get bicycles for all of them. And give them jackets with reflective decals to keep them safe. And while I’m wishing, I’d like dedicated bike lanes too. I can dream, can’t I? No, my disappointment wasn’t self-serving. I’ve seen how hard Pat has worked in the effort to incorporate the Redland. I support Redland incorporation. I hope Pat won’t be going too far and will be available for guidance, if needed. My best wishes to Pat and her family in their new endeavours.